The total number of world fixed broadband subscribers has now reached 984 Million (up by +2.53% during Q2 2018), which is up by 87 Million in the past year. Overall around 80% of subscriptions are now fibre optic (FTTH/B/C) and cable (DOCSIS) based, with older copper lines (ADSL) being cast toward the history books. The report, which was produced by Point Topic, notes how the old generation of pure copper broadband connections (e.g. ADSL) have continued their decline by falling -7.6% over the past year. On the flip side faster fibre-based services have grown by +30%, which splits out to +5.8% for hybrid fibre (FTTC / G.fast) and +23.8% for ultrafast “full fibre” (FTTH/P) style connections. 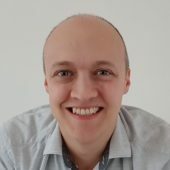 Meanwhile Cable (Hybrid Fibre Coax / DOCSIS) networks, such as those offered by UK ISP Virgin Media, grew by +4.9% and Satellite connections also increased by +0.6%. At this point it’s interesting to note that fixed wireless connections appear to have declined by -3.6% over the past year, which is most likely because the bulk of countries are focused on investing in fixed line upgrades. At present most of the growth in fibre is still coming from Asia (particularly East Asian), which in turn was mainly being driven by China where Fibre-to-the-Home (FTTH) grew by 26% in the past year (i.e. 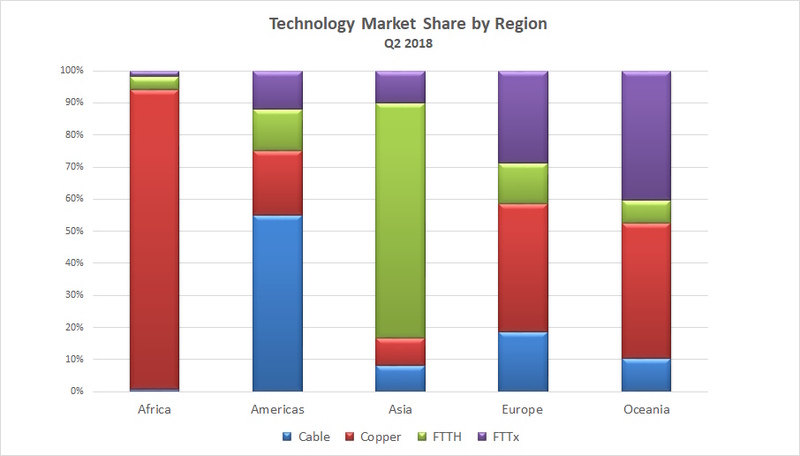 80% of global FTTH net adds in the period). 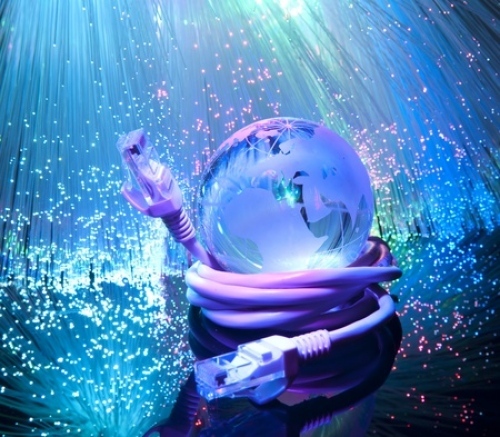 However it’s noted that South Africa, Brazil, the UK and France also saw “significant FTTH quarterly growth rates” – 19%, 14%, 10% and 9% respectively. This is a particularly interesting development because previously the UK’s growth rate was barely even visible, although over the past two years we’ve seen a surge in the build rate (See our ‘UK Summary of Full Fibre Broadband Plans and Investment‘). 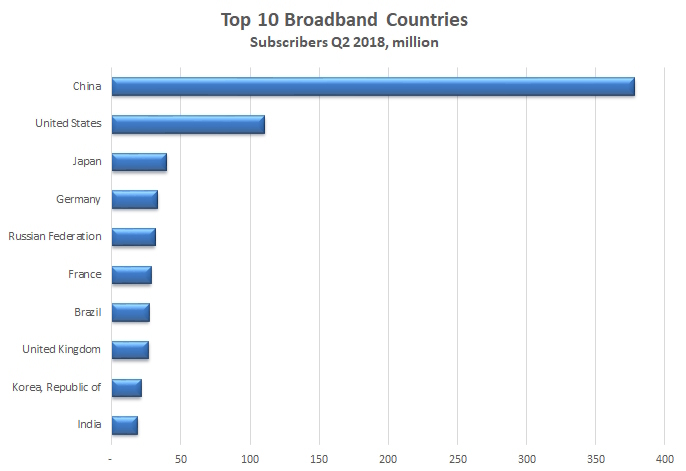 The United Kingdom also remains one of the top 10 largest markets for broadband subscribers (by any technology) in the world, although in recent years we have slid a few places down the table and Brazil is the latest to overtake. In fairness this table doesn’t mean all that much since you’d expect countries with larger populations to eventually move higher as their coverage catches-up with developed markets. I am awaiting that – It is getting pretty boring now tbh. Or somebody who has jumped the bandwagon appearing in the comments.